Have you ever stamped on your designer series paper? This is such a fun technique and way to bring some extra interest to your cards. To get the best look using this technique you want to choose designer series paper that does not have a lot of bold patterns in it. That will take away from the look. Instead, choose papers that have subtle patterns or simple monochromatic patterns. The First Edition Newsprint Designer Series Paper works well for this technique. In order to give my flowers from the Summer Silhouettes stamp set a little more pop I used Jet Black Stazon to stamp them. I also embossed the tops of the flowers using the Melon Mambo Stampin’ Emboss Powder. The ‘Thanks So Much’ stamp from the Oh, Hello stamp set is also embossed in Basic Black. 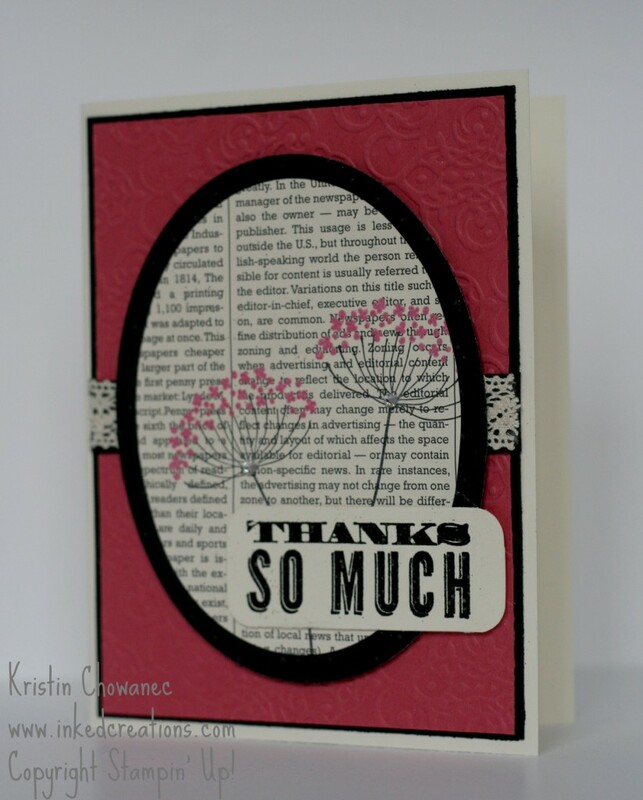 There are a lot of fun embossed layers going on in this card as well just to add to the look. So get out your designer series paper and stamp away!